It’s no secret that we’ve been working with Archives for some time – starting with the State Records Office of Western Australia. We’ve now worked with Archives right around Australia, ranging from State Archives (such as Public Records Office of Victoria), Universities (like the University of Tasmania) and a range of other organisations (like schools, such as St Aloysius College). We have a few other projects we really look forward to showing off around Archives in the next few months, too. 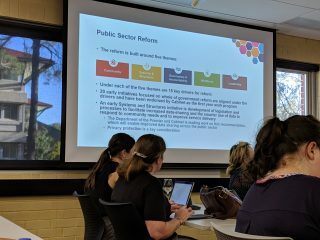 A couple of weeks ago, I went along to hear Duncan Ord, the Director General of the Department of Local Government, Sport and Cultural Industries (where the State Records Office sits these days) talk about the vision for “Whole of WA Government Digital Information Management Infrastructure Strategies”. This was an event that was created by the Australian Society of Archivists, along with a range of support to make it happen. Duncan gave a really wide-ranging presentation that covered a range of topics, and then went even further in his question and answer session at the end. He had entered the lions den in many ways, and it was great to see him there and engaging with people before, during and after the event. I was left with a sense of how difficult his position is, that’s for sure! Is that transformative stuff needed across the whole Archives process and not just the tech? My thinking on that is… “maybe”. There’s a lot to think about when you start talking about “transforming” businesses or business processes, and this isn’t something that we often see at the ‘project’ end of the procurement process. At the last few Australian Society of Archivists conferences I’ve been to there’s been discussion about change and transformation, from our discussions in Parramatta in 2016 (with Ernest Borgnine), Melbourne in 2017 (with Alice in Wonderland) and here in Perth last year (with the Blade Runners). After three years at those conferences, I’m not completely convinced that there is an appetite for transformation and change there – I left the Perth conference feeling particularly hopeful, but so far not much has happened (yet, at least – but there is stuff going on!). But as I said, trying to understand the big picture through the lens of a procurement process really is difficult – a bit like some sort of strange magic eye style picture. Trying to transformative when all you can see is one small part of the big picture (and you also have to try to focus somewhere else to trick your brain into seeing the actual picture) is pretty difficult! As consultants we’re asked to be innovative – but little in the way that procurement processes operate actually enables that – unless you’re in Queensland, and you have great programs like the Testing Within Government process, which really do help innovation to happen. These sorts of events to show the big picture are really important for an industry. They get the people with the vision and ability to make things happen to meet directly with their broader community, and develop an understanding from both sides. We’ll keep trying to innovate in our own small ways, but still keep the delivery of the more ‘workhorse’ solutions happening. There’s a lot going on in Archives around Australia and across the globe at the moment, including some exciting initiatives underway that I hope to talk more about soon. But if you’re interested in talking to us with some wicked problems, interesting challenges or just advice about what has been working, (and what hasn’t), then feel free to drop me a line by email, or via Facebook, Twitter or LinkedIn.